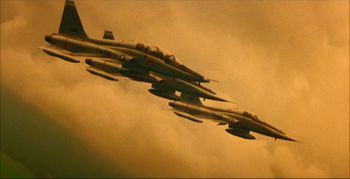 Northrop F-5 Freedom Fighters in Apocalypse Now. The Northrop F-5 is a family of supersonic jet fighters used by militaries around the world. The F-5 'Freedom Fighter' is the original version developed from the Northrop T-38 Talon. The F-5 Tiger II is an advanced version. This page lists all films that feature a variation of the Northrop F-5. For the trainer version, see Northrop T-38 Talon. Pages in category "Northrop F-5"
This page was last modified on 21 June 2010, at 18:33.